National Scout Organizations are obliged to develop their own training systems that will be targeted towards all adult functions existing. Training systems should include all the competencies required for these functions. Personal development of these adults must be a provision of every system as well. The training system needs to be not only focused on internal needs but also able to recognise and respond to trends in the community and in wider society. This approach will help National Scout Organizations to develop a real growth strategy. Responsible persons for coordinating training at all levels in the association should identify training teams, should develop trainings of trainers and should develop and manage the training resources required. This should mean a good gender balance, real diversity of leaders and with opportunities for young leaders to participate. The training system must be considered as a continuous cycle, consisting of defining training objectives, carrying out training needs analysis, delivering training, assessing reactions to training, and measuring the bottom-line effects of training in local Scouting. Adult training is accessible to all members of the organization / association, regardless of education, personal circumstances or special needs. Training of adults ensures understanding and use of elements of the Scout method, such as learning by doing, small group work, work in nature. Some NSOs are now working towards providing opportunity for adults to be externally recognised through the training they do in Scouting (this is valid especially for NSOs/NSAs involved in ROLIS project). Based on these principles, various training systems with different training provisions are created through the European Scout Region. Some of the training systems are based on modules. 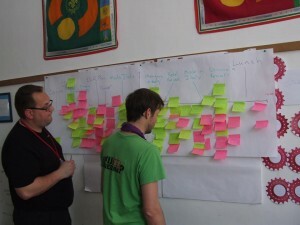 Example of these training systems is the one of the Scout Association UK (https://members.scouts.org.uk/documents/Adult_Training/Adult%20Training%20Scheme.pdf), that includes 37 modules, and it is expected that adults complete only those modules appropriate to their role. Some NSOs are providing training courses for some special Scouting skills and they are called “specialistcourses”. Examples of this kind of course can be found in Turkey or in Slovenia. Some NSOs from South East Europe are using very similar training systems (Serbia, Bosnia and Herzegovina, Montenegro), and it can be understood having in mind that they were previously functioning in one country or organization. As there are as many different training systems in Europe as there are NSOs/NSAs, a more detailed description of them would require a lot of space and a lot of time for reading. However, we are open for those interesting to describe in more details their training systems and to share them here on Euroscoutinfo. If you are interested to do so, please send us a short description of your training system (to jbajraktarov@scout.org),and we will be happy to publish it. Addtionally if you would like help to develop your training system or explore new approaches and methods, tailored supported from experienced individuals is always available. Please discuss your needs with your Committee Contact.